At the time of my SCAD event, I was an active single mother of three. I was 43 years of age, 168cm in height and weighed 63 kilos. I had always tried to stay relatively fit. I ate a balanced diet and I have never smoked. I drank alcohol on occasions. I changed jobs in August 2012 to work an Administration Coordinator for a small International Preschool in Norway. I had previously worked as an Administration Assistant in a larger International School, but after being head hunted I changed schools to be closer to home and reduce my hours. The timing of this was perfect as I had gone through a relationship breakup in 2011. On 1 May 2013, I had spent the day outside in my garden with two of my three children aged four and six. It was a lovely spring day. I experienced my first symptoms during the evening. The children were in bed and I suddenly felt unwell, but in no particular pain. I tried to shake off the unwell feeling by keeping busy. I emptied the dishwasher to distract myself. However, I continued to feel really strange and unwell. Then things suddenly got worse. My left arm became very heavy and I felt a tightening in my jaw. I decided to ring on my neighbour’s doorbell for advice. We quickly concluded to call the emergency services. They arrived within 10 minutes and they confirmed it was a heart problem and that I would need to be admitted to hospital straight away. I quickly called members of the family to come and look after the children as they were fast asleep in bed. The children’s grandmother could manage to be at my place within 30 minutes, so I left in the ambulance and my neighbour kept an eye on the children until she arrived. Once in A&E I remember feeling very calm, amazingly calm. After a lot of blood tests and examinations I was moved to a heart observation ward. On the morning of 2 May, I recall being violently sick. I was taken for a coronary angiogram and was immediately referred to theatre for emergency open heart surgery. The angiogram had shown an acute dissection. There were complications during the surgery which meant the operation took a lot longer than planned. Due to internal bleeding after my sternum had been closed, the surgeons had to re-open and operate for a second time. When they tried to close my sternum for a second time, I was so unstable that they had to leave my sternum open until the next day. At this point my next of kin was contacted and informed about my critical condition. I stabilised during the night and bleeding reduced. I received several shocks in order to stabilise the rhythm of the heart. After being left open for 24 hours, my sternum was successfully closed and by the afternoon I was woken up. My mum, my eldest daughter, (14 at the time) and her dad were all by my bedside when I recall waking up the first time. My mum had flown over from England. I was very drowsy and don’t remember anything else that day. On 4 May, the balloon pump that had been inserted via my groin was taken out. I was told that I would be moved from post-op intensive care to a cardio intensive observation ward after a couple of days, but unfortunately I wasn’t stable enough to be moved until 10 May. On 9 May, I had to have a drain inserted through my back to remove fluid from around the lungs. This procedure was repeated five times during the next one to two weeks. I was told this was a typical side effect from the open heart surgery. After being moved from post op, my temperature and bacteria levels in my blood started increasing. Unfortunately I had contracted an infection which meant that I had to be put on strong antibiotics. The actual area and cause of the infection was never found. The doctors concluded it was probably contracted during the time the sternum was left open after the second operation. On 14 May, my pacemaker wires were removed. All my scars, sternum, full inside left leg, lower right leg and groin were all healing well. My youngest children were finally able to come and visit me. My six-year-old wanted my chocolates! My four-year-old just hugged his dad lots and preferred to keep his distance. All the medical equipment around me was just a little too much for him. On 22 May, I was moved to the general heart ward. I stayed here until I was discharged on 28 May. I was now able to start some physio. We started off easy by moving me out of bed to a chair. I felt like I had run a marathon. The goal was to be able to climb a flight of stairs. Only then could I be discharged. Three weeks post op, my catheter was removed and I felt I was on the road to recovery. I had bed sores on both of my heels as I had been lying down for so long but that was the least of my worries. Physiotherapy started. I was linked up to an oxygen tank which was attached to my walker but I was on my feet. Days later, I remember showering for the first time, sitting down on a chair, and not wanting to come out! It was heaven. I was lucky enough to have my own room the whole time I was in hospital and apparently, due to my positivity, all the nurses wanted me as their patient. The doctors and all the medical staff were amazing. Before leaving I agreed to have a visit from 10 medical students who had to try and diagnose my illness simply by observation. The bandages on my chest, full inside right leg, part of left leg and groin made it a little easy for them, but they were puzzled about the fact that I was a fit, young, slim female. Hopefully that put SCAD on the radar for future medics. At the end of May I was fever free and was able to be moved to a rehabilitation home. With a handful of pills in my bag, I felt relief after being in hospital for the whole month. This move meant that my family, friends and colleagues could come and visit me. I stayed at the rehabilitation centre for two weeks. This gave me time to get my body back into normal routines and continue my physio before going home and having to fend for myself. By the middle of June my kids were able to come home again after being with their dad. My mum stayed with me for three months. As I wasn’t allowed to drive she did all the errands with the kids and food shopping and much more. My siblings also flew over from England to take a turn to help out. Friends and family here all rallied around and I will be eternally grateful to everyone for being there when I needed them all the most. By October 2013 I was able to return to work just 20%. This slowly increased over a six-month period. In the beginning of 2014 I started a training programme for heart patients and by May 2014 I was back at work working 9-3 as I did before my SCAD event. In July 2015 I attended a research day with Dr Abi at Glenfield Hospital in Leicester. I received my results letter in 2017 which said I have an ejection fraction of 35% and I do not have Fibromuscular Dysplasia (FMD, which seems to be present in many SCAD survivors). My cardiologist in Oslo has since informed me that based on the Leicester Research day results my body has redirected the blood flow back to the original route and the bypass is no longer in use. Although slightly concerned at first, I have faith in that the body is doing its best to heal itself. I function well in everyday life, although I do have to pace myself and listen to my body. The only restrictions I feel I have is heavy lifting and the restrictions in amusement parks. So I pretty much live a normal life. I attended the second Beat SCAD conference in 2016, and again in June 2018 which was fantastic to meet so many survivors, and all the speakers, Dr Adlam, Dr Abi, and the Beat SCAD trustees. I am closely monitored here in Oslo attending annual check-ups with my cardiologist. I am keen to help with future research programmes to help spread awareness about SCAD. 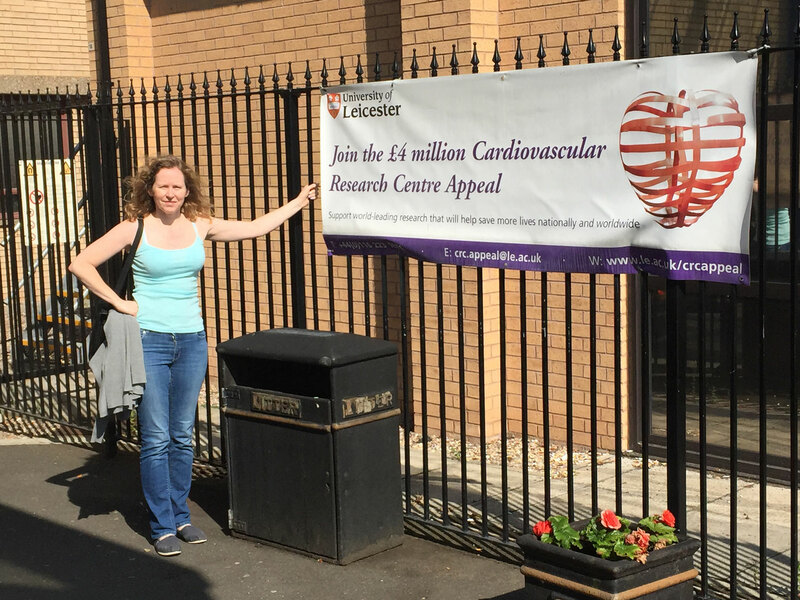 Michelle attended a research day for the Leicester SCAD research project. 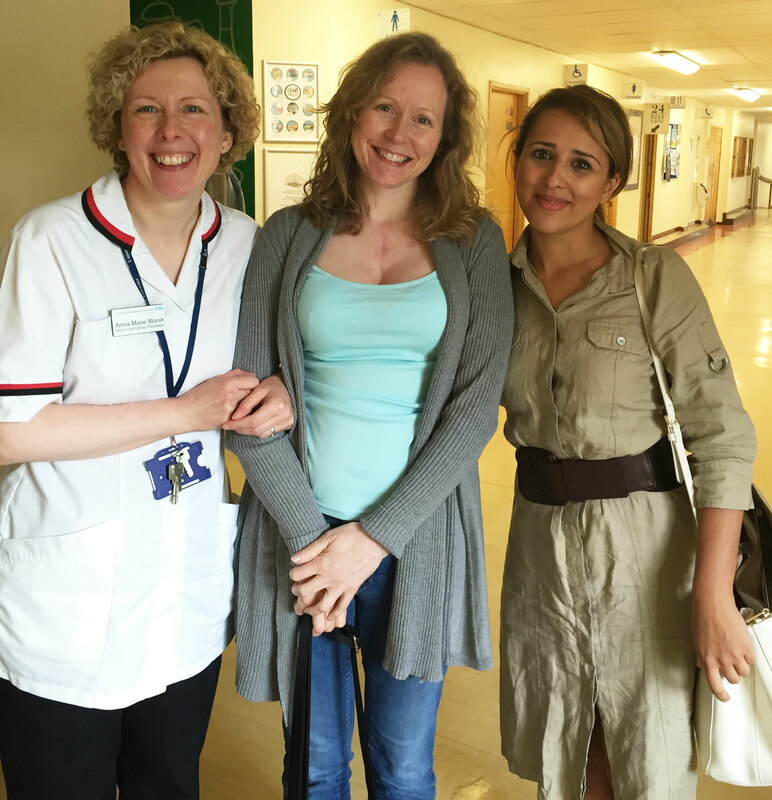 Pictured above (l to r) research nurse Ellie, Michelle and Dr Abi Al-Hussaini. My body has redirected the blood flow discarding the bypass. Although slightly concerned at first, I have faith in that the body is doing its best to heal itself.